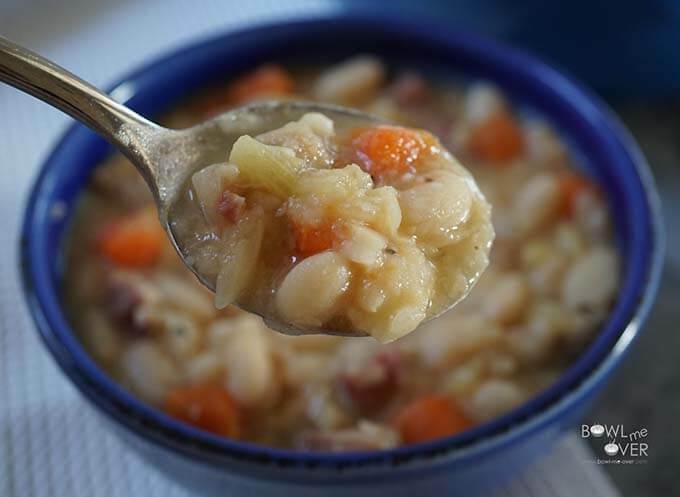 Navy Bean Soup with Ham is an easy meal, slow cooked and delicious! With classic flavors it’s an affordable meal that tastes even better on day two! Big meaty flavor from the ham and creaminess with perfectly cooked beans, it’s a hearty soup that makes an easy lunch or a simple dinner. Who wants some soup? 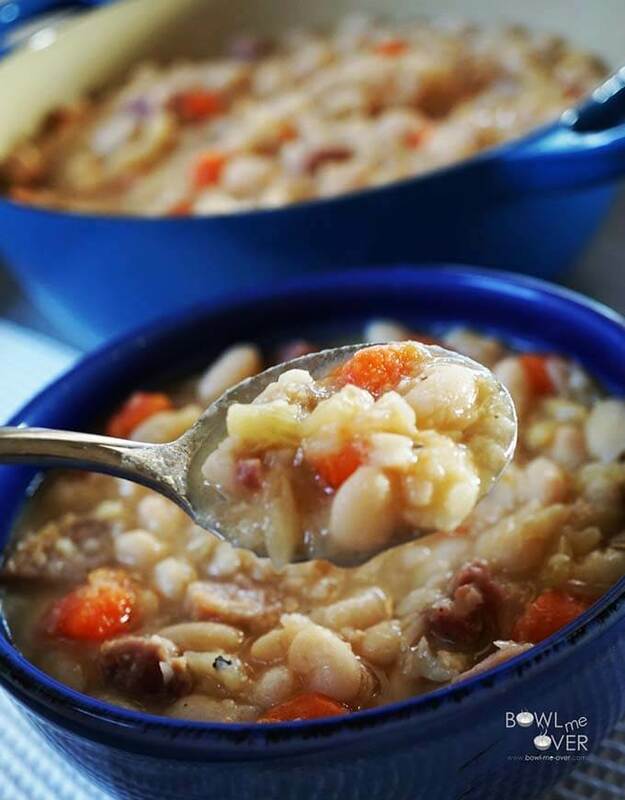 Hearty and delicious this Navy Bean Soup with Ham is a delicious hearty meal! Bean soup has been a go-to meal of mine for years. When I was single and dollars were tight I would purchase a ham and eat it for days (read more about it here – Starting Over After Loss). When the ham was gone I’d take the bone and make soup and eat that for days. Dollars were tight. Packed with protein and vegetables that basic ham and bean soup was the best meal I could afford and is still one of my favorites! I should add too, I debated about sending out another classic wintertime soup recipe. It is mid April, right? But I was reminded when I was speaking to my coach Jenny yesterday that living in California skews things – just because it’s going to be 87 here on Sunday doesn’t mean the rest of the US is experiencing the warmth. Click here to subscribe and receive my FREE Conversion Chart! Let’s talk a bit about beans! Do navy beans have another name? There are several varieties of white beans and they are very common. Navy beans are a small white bean and have an oval, slightly flattened shape. Do navy beans need to be soaked overnight? Soaking them overnight will shorten the cooking time. Add the beans to a large bowl covered with water. 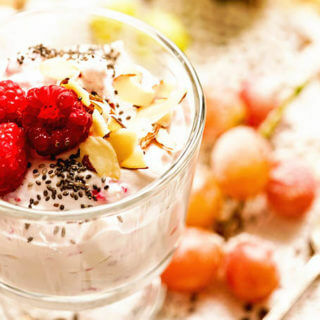 Refrigerate them overnight or they may ferment. Drain and rinse the beans prior to using. What is the quick cooking method for beans? 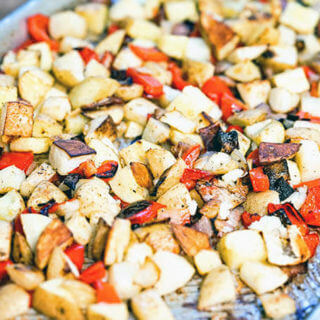 This method shortens the cooking time. Rinse the beans well, add the beans to a large pot. Cover with water and bring to a hard boil for one minute. Remove from heat, leave covered for one hour. Drain and rinse the beans well. Easy bean soup is a great meal for family dinner! Soup is good food! Ham and Bean Soup is a staple. When it’s bubbling away on the stove, the beans slowly soften and become soft and creamy, the ham is fall-off-the-bone tender. It’s hearty and so flavorful and costs less than $1.00 per serving, talk about value! Want all of my tips and tricks to make the BEST Soups and Stews? Click here for your FREE guide! Want to take your homemade soup to the next level? Add a squeeze of lemon and minced parsley at the end of the cooking process. It brightens and freshens the flavor of the soup! Also, don’t salt until the end. If you add salt in the beginning the beans will be tough. 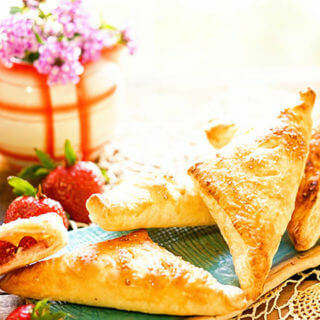 Wait until the end of the cooking time to taste and adjust flavors. Often times between the ham hock and the ham, there’s plenty of salt – when this slowly cooks, the salt distributes into the broth. It just might be salty enough! 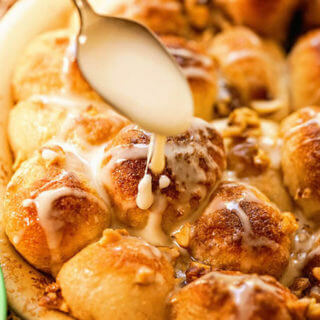 You’ll definitely want to give this simple recipe a try! Let’s make some soup! More of my favorite hearty soup recipes! Navy Bean Soup with Ham is a slow cooked delicious meal. 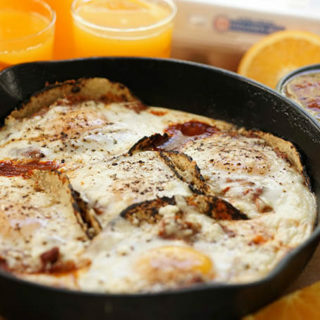 Classic flavors and easy to make it's an affordable meal that tastes even better on day two! Big meaty flavor from the ham and creaminess with perfectly cooked beans. Pick thru the beans, checking for small rocks, blemished beans, etc and remove. Prepare the beans by following product directions by either soaking the beans overnight, or using the quick soak directions. Set aside. In a large stock pot, heat the olive oil over medium high heat. Add the onion, carrots & celery to the pot, season with the black pepper & red pepper flakes & sauté until tender, 5-7 minutes. Add the bay leaf, ham bone & beans to the pot & add enough water to cover the beans and simmer covered for 1 to 1 1/2 hours, stirring occasionally until the beans are tender. When the beans are tender, taste for seasoning. You may need additional salt (but probably not). 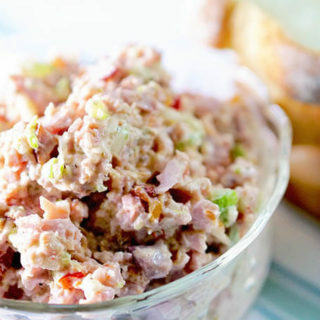 If you're adding additional ham, add it in now. You can also remove the hambone and pick the meat off it and add the meat back to the soup. When you turn off the heat add in the lemon juice & parsley, mix well and serve! Looking for more bean soup recipes? Smoked Ham, Kale and White Bean Soup from Garlic and Zest – comfort food gets a healthy addition with a little chopped kale. Classic Ham and Bean Soup – Simply Sated – the ultimate comfort food! 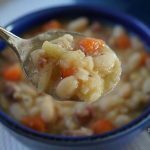 Slow Cooker Ham and Bean Soup from Damn Delicious – Hearty, cozy and easy the slow cooker does all the work for you. 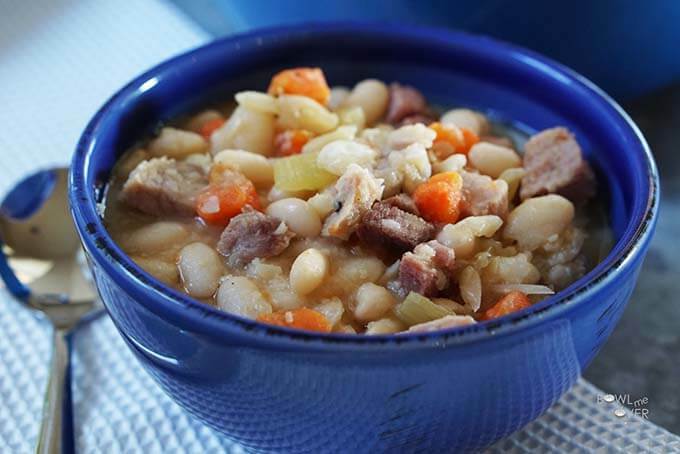 Navy Bean Soup with Ham is an easy meal, with classic flavors. It’s an affordable meal that tastes even better on day two! (freezes well – that’s a bonus!) Big meaty flavor from the ham and creaminess with perfectly cooked beans, it’s a hearty soup that makes an easy lunch or a simple dinner. Love a great soup and Bean Soup is just so easy, affordable and delicious! Thanks Mom!! Ham and Bean soup is the classic soup, one of my fav’s! Thanks for stopping by Audrey! Looks delish. I love soup in the summer too. Great combo. Soup is such a comforting meal, I agree!